Who doesn’t love lettuce cups? They are light, crunchy, and flavorful. The fact that you can eat them with your bare hands makes them that much better. These tempeh lettuce cups get their tastiness from sweet, juicy mango and crisp water chestnuts. Did I mention they can be ready in under fifteen minutes? YUM! In a large skillet, heat 1 tablespoon of oil over medium heat. Sauté the onion for 1-2 minutes, then add the tempeh. Cook for another 3-5 minutes until golden brown. While the tempeh is cooking, combine the soy sauce, rice vinegar, sugar, almond butter, ginger, garlic, and the other tablespoon of oil into a small bowl. Stir well. Add the sauce mixture to the skillet, along with the water chestnuts, bell pepper, and mango. Cook for another 1-2 minutes. You want the pepper to remain a little crunchy. Let the mixture cool for 2-3 minutes so it won’t wilt the lettuce too much. Then enjoy! Every time I eat these tempeh lettuce cups I get so happy! I love eating healthy, vibrant food that’s easy to prepare and makes my body feel good. 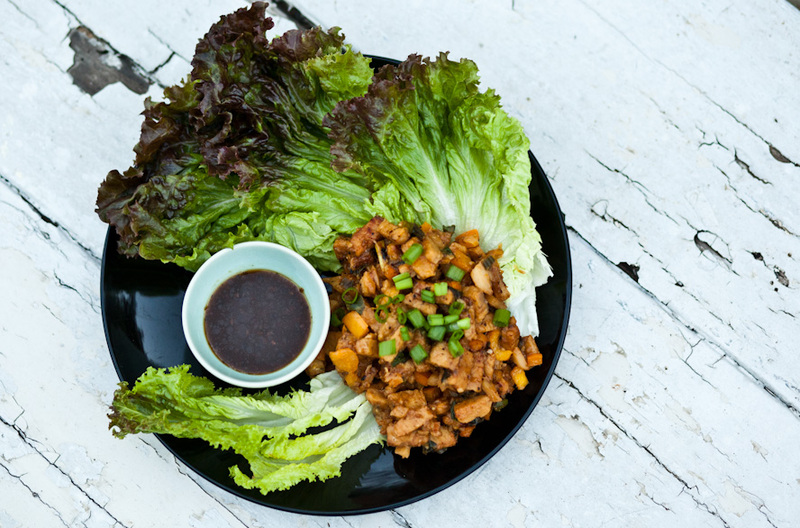 The crispy crunch of the lettuce is the perfect complement to the savory tempeh mixture. It’s sooooo good. Did you try this recipe? We want to see! Post a photo on Instagram with the tag #carrotsandflowers 🙂 It’ll make us sooo happy! If you enjoyed this recipe, check out out our Strawberry Kale Salad or our Vegan Crab Cakes!